In the 1970s, Playwright Alan Bennett met Miss Sheppard; a brash, bigoted, cantankerous old woman who lived alone in a decrepit van. Despite not getting along with Miss Sheppard, Alan allowed her to park her van in his driveway for a few weeks until she could find her feet. However, Miss Sheppard wound up staying in that driveway for 15 years. Bennett has since documented these 15 years in a 1999 play called “The Lady in the Van”, which starred Maggie Smith as the titular Lady and netting herself a “Best Actress” Nomination at the 2000 Olivier Awards. Maggie Smith reprised the role for a 2009 BBC Radio 4 Adaptation where Alan Bennett played himself and now we have the director of the original stage-show, Nicholas Hytner, returning to direct this film adaptation with Alan Bennett writing the script and Maggie Smith hoping to prove that third time’s the charm. 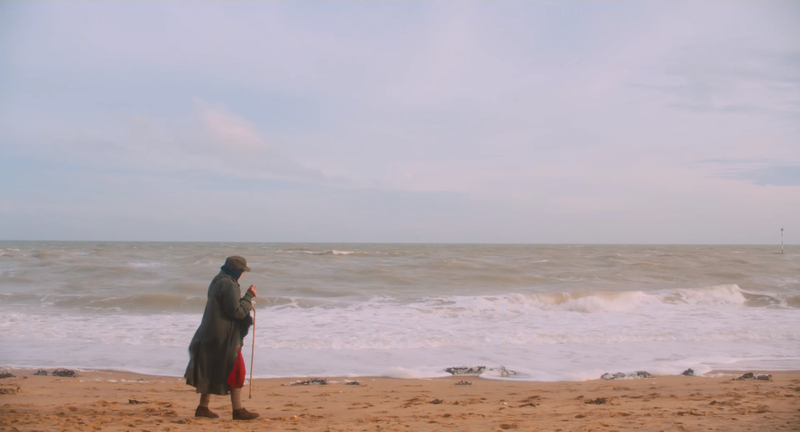 With a who’s who of British talent on board and source material that has been refined for just as long as Miss Sheppard originally stayed in Alan Bennett’s drive, surely ‘The Lady in the Van‘ can leave some sort of impact or find a fresh way to tell this story. Or has this 15 year-long story become rusty and dated in the 15+ years it’s been told? In the 1970s Miss Sheppard (Smith) garnered a reputation for living in locations across England in her Van. Now it’s Camden’s turn where playwright Alan Bennett (Jennings) is living and he offers his driveway for her to live in her van for a few weeks. However, as the years go by and Miss Sheppard becomes a staple of the community, Alan and the rest of Camden start to learn more about her past and just what led her to living in a van in the first place. 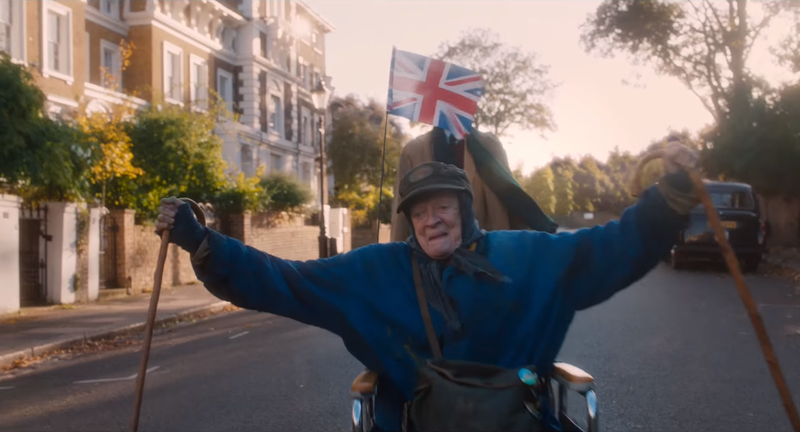 ‘The Lady in the Van‘ does span the whole 15 years that Miss Sheppard stayed in Camden, spending the first weeks and months on the street outside his house, much to the chagrin of Alan Bennett’s wealthy, uptight neighbours, before Alan offers his drive until Miss Sheppard finds her feet. The circumstances surrounding Miss Sheppard’s living conditions and her life up until she became homeless have not been hinted at much in the marketing material, so I won’t delve into those details in this review but suffice it to say ‘The Lady in the Van‘ does the unthinkable and manages to take a cantankerous and bigoted woman and make the audience completely sympathise with her. The movie may be mainly sold through the marketing as a comedy and it definitely qualifies due to its laugh-a-minute humour, sight-gags and quick-witted humour, but as the movie progresses it does gradually unfold to become a tragedy where no one person or ideology is to blame for Miss Sheppard’s state-of-mind or circumstances, but a sequence of tragic events that ultimately formed this woman’s outlook. In one of the movie’s closing scenes in my screening (full of the film’s target demographic; the over 50s) there were a lot of sniffles and Maggie’s Smith performance is so subtle but the ensuing scene could easily be one of the most profoundly sad moments of the year. BUT, ‘The Lady in the Van‘ is still a heart-warming and endearing comedic character piece with plenty of laughs, not only through Alan Bennett’s witty and self-deprecating script but mostly through the performances. Since this is Maggie Smith’s third iteration of the role, it’s not surprise that she’s absolutely superb as Miss Sheppard in one of the most emotionally varied pieces of acting this year. It would be a disservice to say that Maggie Smith gives one of the best performances of her career because Smith’s career has been so varied, memorable and consistently brilliant and Miss Sheppard is the type of character who requires such a superb veteran of the stage and screen. Her character needs to walk a fine line between likeable, yet emotionally distant until just the right moment. A character who is distinctly unlikeable but sympathetic when hoodlums frighten her by trying to tip the van over while she’s still inside it. But character-revealing beats like that are balanced very well with sequences where Miss Sheppard, in a wheelchair, asks Alan to push her up the road so she can roll down the hill for fun. Or the moment where Miss Sheppard is raised up by a lift at the back of an ambulance and she immediately wants to do it again. 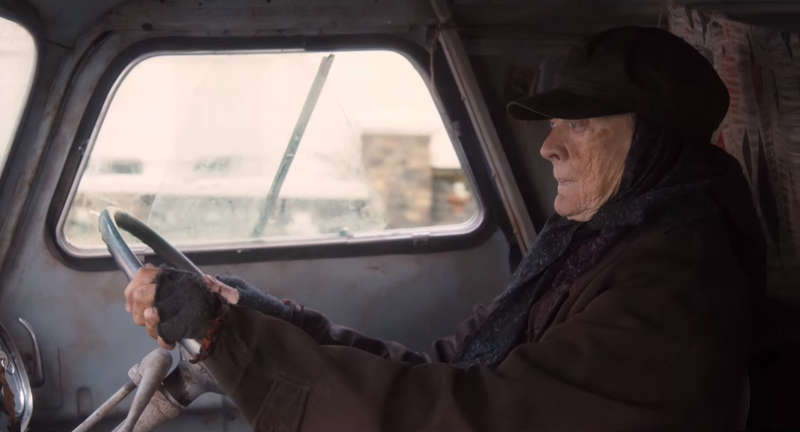 ‘The Lady in the Van‘ may be a movie of great sadness, but it’s also a movie with great happiness and charm with a wonderful lead turn by Maggie Smith. 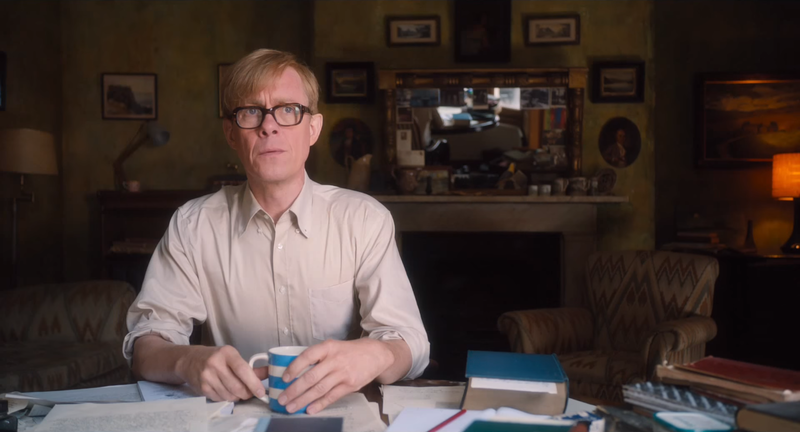 Although, “lead turn” might be a disingenuous term as you could easily argue that Alan Bennett is the main character as he’s the audience cipher and the narrator of this story as he talks to himself in his house in Camden. One strange decision in the ‘The Lady in the Van‘ movie (I’ve not got a clue if the stage show or the radio play follow this format) is that Alan narrates the story while sharing dialogue with an alternative version of himself. There’s the “normal” one that goes out and interacts with people and lives his life and there’s the “writer” version that stays inside and writes his plays and scripts, vowing to never write about Miss Sheppard. Knowing that Alan Bennett is the writer of the screenplay it’s hard not to view these segments, while sporadically charming, as self-indulgent. Honestly, you could remove the “writer” alter-ego and you don’t lose much from the movie and you streamline a film that already feels like it’s around 5-10 minutes longer then it needs to be thanks to its “Return of the King”-style multiple endings. It also detracts away from the other citizens of Camden and the large cast comprising of a who’s who of British talent in blink-and-you’ll-miss-it cameos, including Dominic Cooper, James Corden and Samuel Anderson to name a few. Frances de la Tour, Roger Allam and Deborah Findlay play Alan’s neighbours who are also privy to Miss Sheppard’s antics and it feels like a lot of these great actors are dressed up with nowhere to go as the script doesn’t serve them or give them much to do, including Jim Broadbent who is obligated to appear in every British feature-film in a role that’s not been remotely hinted at in the marketing material so I won’t spoil it here. Though, to be fair, this is Maggie Smith’s show with Alex Jenning mostly being on hand to react to everything she does and ‘The Lady in the Van‘ is able to engage and entertain the whole way through, with the exception of having a rather excessive and confusing epilogue. Speaking of confusing, Miss Sheppard throughout the movie gets new vans to replace her old one and it’s never quite stated where she got these vans from or where she got the money to purchase them, but that’s just a nitpick. I also do wish that the idea of Alan Bennett offering his drive and resources to an unrelated, bitter old woman while he puts his caring mother in a home was expanded more as it’s a very interesting starting point and clearly the topic of his mother is a strong motivator for Alan as he’s written plays on the subject. On the topic of plays, director of the 1999 Stage Play of “The Lady in the Van”, Nicholas Hytner, returns for the film adaptation. This isn’t Hytner’s first Alan Bennett film collaboration as he also directed the Bennett-penned ‘The History Boys‘ so it’s clearly a match made in heaven and he does a good job here, clearly working well with the talented actors. The movie juggles a large cast, lots of location filming, split-screen acting, different time periods and a variety of genres but it all gels together and feels cohesive. It’s a well put together movie that feels bigger than a TV-movie with a strong, if understated score from George Fenton despite music being a key factor in the movie. ‘The Lady in the Van‘ is a heart-warming and often profound character-piece that is fortunate to have one of the most respected British actors in its lead with Maggie Smith. She carries most of the movie on her shoulders and doesn’t miss a beat in an incredibly versatile role in an equally versatile screenplay by Alan Bennett that, despite it often falling into the trap of self-importance, does work the balance needed for a biographical dramedy. 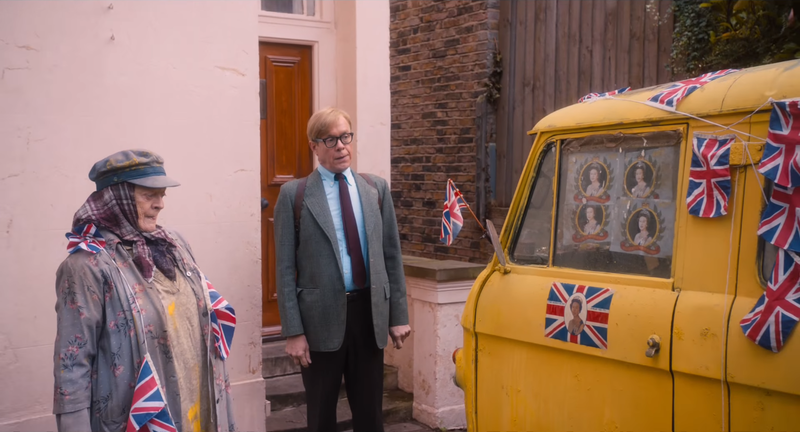 ‘The Lady in the Van‘ is another strong showing in what has been a banner year for the U.K. film industry and it should connect with every single demographic (despite the multiple, frequent F-bombs even though this is a 12A movie). I give ‘The Lady in the Van‘ 4 stars out of 5.